Welcome to the world's first Branded Hostel! Step into the world of Sandeman Port Wines, at The House of Sandeman Hostel & Suites. 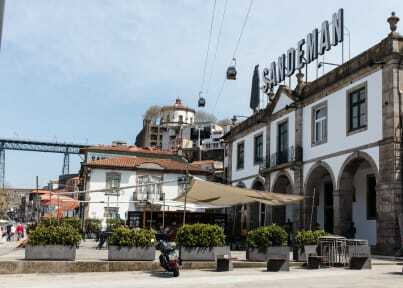 Set in one of Porto’s most iconic buildings, this hostel is right on top of the Sandeman wine cellars, and right on the edge of the river Douro, overlooking the Porto downtown area. We are located in Vila Nova de Gaia, only 5 minutes away from Porto Historic Centre. Once you have crossed the Dom Luís I Bridge you are in Porto, ready to discover some of the best landmarks and attractions of this city such as Ribeira Square, the Porto´s Promenade and River Bank (Ribeiro do Porto), Museu do Carro Elétrico or Casa da Musica, amongst other wonders and attractions of our city. All dorms at the House of Sandeman Hostel & Suites have their own private full bathrooms ( up to 4 per dorm), with complimentary shower gel, shampoo and hairdryer. The custom designed beds are inspired by the Port Wine barrels and come with king-sized single mattresses for extra comfort. All reservations include breakfast and a bath towel. The 12 private suites include their own full bathrooms, with complimentary shower gel, shampoo and hairdryer. The suites feature a double bed, TV, AC and decorated with Sandeman artwork. 9 suite also feature riverfront views. All reservations include breakfast and a bath towel. Guest are also invited to join in the several activities organised by staff members, taking place in the guest lounge. The heart and soul of the hostel, the guest lounge is also where the kitchen is located, as well as the front desk/ bar. Perfect to grab a drink and get to know your fellow travellers! Cancellation policy for flexible rates: 48h before arrival. In case of cancellation, modification after this period the total amount for the reservation will be charged. In case of no-show the total amount for the reservation will be charged as a penalty. The total amount for the booking will be charged at the check-in. Non-refundable rate: the total amount for the reservation will be charged in the moment of the booking. Penalty in case of cancellation, modification or no-show: 100% of the booking. Breakfast is included. The breakfast selection varies according the type of room booked. Tuve una estadía maravillosa. El personal muy atento y las instalaciones fantásticas. very cool place, huge beds, nice bathrooms and an extremely professional and kind staff who provides a wonderful service. 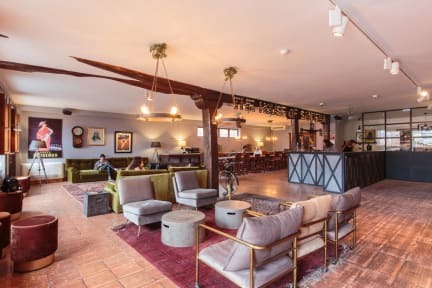 Uno de los mejores Hostels en los que he estado!! Realmente lindisimo, todo nuevo e impecable, las piezas muy amplias con varios baños privados, las camas muy cómodas, el personal súper amable. Muy muy recomendado. Es espectacular, ubicado en plena zona turística, se llega caminando a la estación de bus y de tren, la limpieza genial, las habitaciones gigantes, cómodas, con locker muy seguros, desayuno muy bien. Realmente no lo dudes. Muy barato para lo q es!